Home > Grain > Post Easter sale success. 20 Apr Post Easter sale success. Sales resumed following the Easter break with the largest offering for the season requiring Melbourne to sell over three days. 54,409 bales were offered with 51,066 sold, well above the weekly average of 41,000 bales sold for this season. Despite the increased offering, the Eastern Market Indicator (EMI) lifted 4 cents to 1776 cents, while in US$ terms the EMI found an additional 12 cents to settle at 1376 cents (Figure 1). The AU$ didn’t provide the wool market with any favours. It’s held steady over the past couple of weeks at US$0.77 or better, which was represented by the solid result of the EMI in US$ terms. Fremantle sales also fared better, the Western Market Indicator (WMI) gained 13-cents to 1884 cents. Despite the solid performance, sellers in W.A. were underwhelmed and still passed in over 9% on Thursday & 7.8% for the week; while nationally 6.1% was passed-in. This week, the fourth largest weekly $ value of wool was traded since AWEX commenced reporting on auctions in 1996, with $97.4 million flowing back to wool producers for an average bale value of $1,907. It was noted that burry or high VM lots found support, especially towards the end of the week. Our reports over the past few months have regularly noted that secondary lines were often struggling to find buyer support, so this change in sentiment is welcome news. As the higher VM volumes ease we usually see the severe discounts also ease; the next couple of weeks will tell the story if this is the start of the improvement or a one-week wonder. Crossbred types again had a mixed result, with finer types (28 – 30 MPG) finding good support and lifting 20 to 40 cents. However, stronger microns were irregular and tended cheaper. Merino skirtings followed the direction of the fleece types, although generally slightly more modest price increases were noted over the week. Merino Cardings had another good week, posting another 27-cent improvement average across the three cardings indicators. Next week just under 41,000 bales are offered, a significant reduction on this week’s sales. This was another week of larger clearances than the previous sale, with the market finishing in a solid state after a slightly soft opening. It feels that the short to medium outlook is positive based on the current market levels and clearance rates. 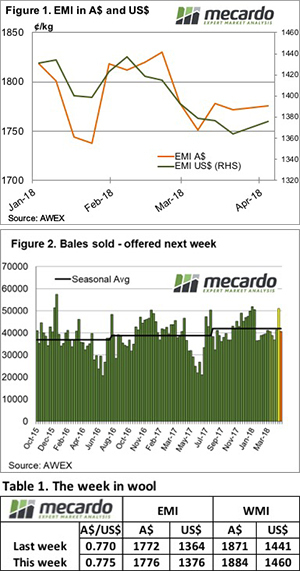 On top of the solid performance in the current market, AWEX report that volumes are predicted to decline after this sale, with the forecast dropping below 40,000 bales in the coming weeks.